Former lineal Middleweight champion Jermain Taylor (33-4-1, 20KOs) has sent word to the boxing world through his lawyer Hubert Alexander that he indeed plans on making a return to the ring once his pending legal cases and Mental evaluation are squared away. Taylor, now 37 last fought in October of last year when he defeated Sam “King” Soliman for the IBF 160 lb championship of the world. It was the second time in Taylor’s career that he had held Middleweight Gold. Taylor was stripped of that title earlier in the year after failing to defend against mandatory Sergio Mora due to allegations and arrest concerning gun-play. The troubled former star has three pending legal cases and he’s underdoing a mental evaluation. In the first case, Taylor is accused of shooting his cousin outside Taylor’s Arkansas residence last August. The second case stems from Taylor opening fire and threatening a family after a Martin Luther King Jr. parade in Little Rock, Arkansas in January. And the third case is related to Taylor beating up a patient at his rehabilitation center. Taylor is currently incarcerated without bail at the Pulaski County jail. He appeared in court on Monday for a hearing and is due back on September 14 when the court expects the boxer will finish up his mental evaluation. When local reporters rabidly queried Taylor’s lawyer for more information concerning the pending legal cases and details regarding the status of the former Middleweight Champions mental state, Alexander refused to discuss these matters but appeared very optimistic of the final outcome of both the mental evaluation and pending court cases being favorable to his client as he responded simply with the following comment. “We plan on boxing again, if that tells you something,” Taylor said to Arkansas Online. 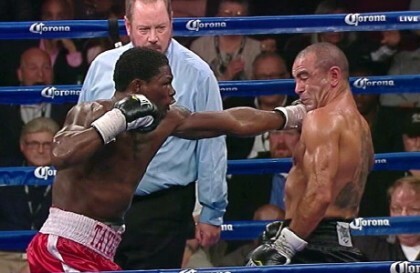 Jermain Taylor began his pro career in 2001. He defeated Bernard Hopkins twice in 2005 for the undisputed Middleweight championship of the world and made 4 successful defenses of his crown before losing to Kelly Pavlik in 2007. He won the IBF title for the 2nd time last October before being stripped this February. Next boxing news: Markussen Q&A: ‘’Nielsen is just a young kid who feels threatened!